Two Perfect Things. . . There are two things that I think are perfect. Picnics. And, circles. Picnics are romantic for two and awesome for many. It’s just you and those that you love sitting close to each other and nature eating yummy food (picnics make all food yummy) having nothing better to do than connect with each other. What can be more perfect than that? And then you add in picnic baskets and picnic blankets and. . . oooooh, I just can’t take all the perfect yumminess! So, I’ve been dreaming lately (literally and figuratively) about Picnic Quilts. Here where the circle enters. So, rectangular quilts were made for beds. And the shape of a quilt should reflect the use of the quilt. What would be more perfect for a picnic than a Circle Quilt? Yes, you heard me right, a Circle Quilt. People sitting and eating seem to fit very easily within the space of a circle. Plus there’s something that the circle the signifies togetherness and inclusion and love. OK, maybe I’m reading into this a little but, a circle picnic quilt just seems right to me. 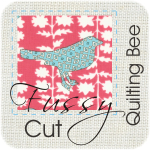 I have been pretty obsessed with circles lately myself, but I never thought to make the quilt itself circular until I saw yours at the guild meeting. What a fantastic idea, and I confess I’m totally going to steal it! I can’t stop looking at it! It is fantastic!!! To say I LOVE it is an understatement!!!!!! How did you get it in a perfect circle? 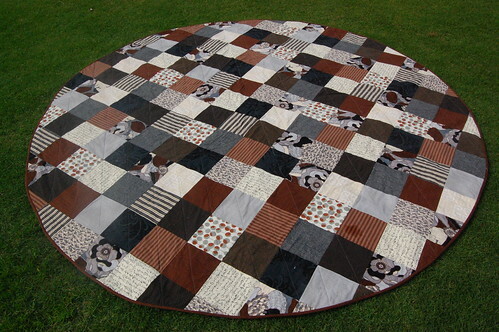 What a fabulous circular quilt! I love this! I can picture a group of friends sitting on this quilt having a wonderful time. Thanks! So glad you love it too! Hi! I’m a fan of circles, and just came across yours on flickr. 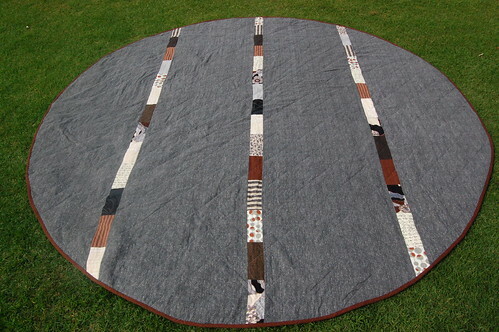 Congrats on your new blog, and on a very cool circle picnic quilt! This is so cool, Latifah! 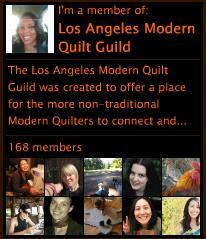 Might have to add a circle quilt to the queue. I gotta know how you got it in such a perfect circle!!! I made a Christmas tree skirt last year and the circle came out all wonky. Luckily it’s a tree skirt and not a quilt because the wonkiness does not show when it’s all gathered under the tree, but it was frustrating at the time! It’s a great idea, a circle picnic quilt. And I love the colors and pattern!